In this version 0.3 I have added a logging channel for Gophermoon. Writing a log-file into the filesystem does not work, as Gophermoon runs inside an ephermeral container, and all changes to the file system are lost once the client request is done and the session terminates. So logging is done via syslog. While it is possible to have a syslog-daemon (or systemd-journald) running inside the container, that would make the container more complex. My solution is to have the systemd unit catch all data from the stderr file descriptor and send that to syslog (and implicit to the systemd journal as well). Standard input and standard output are still connected to the socket (from Systemd socket activation, see Part 1), but all data written into standard error will now end up in the Syslog/Journal. Dez 23 22:54:44 gopher.defaultroutes.de systemd: Stopping GopherMoon - Gopher-Server in Lua. Dez 23 22:54:44 gopher.defaultroutes.de systemd: Listening on GopherMoon - Gopher-Server in Lua. Dez 23 22:54:44 gopher.defaultroutes.de systemd: Starting GopherMoon - Gopher-Server in Lua. 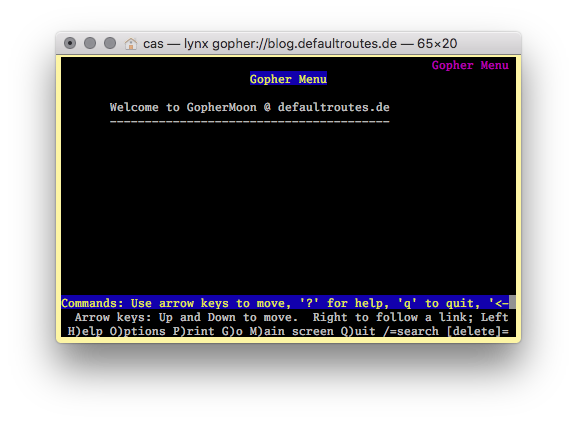 Dez 26 19:21:28 gopher.defaultroutes.de systemd: Started GopherMoon Gopher Server in Lua (185.22.143.172:49828). Dez 26 19:21:29 gopher.defaultroutes.de systemd-nspawn: [C]: in ? Dez 26 19:21:29 gopher.defaultroutes.de systemd: Unit gophermoon@172-5.45.107.88:70-185.22.143.172:49828.service entered failed state. Dez 26 19:21:29 gopher.defaultroutes.de systemd: gophermoon@172-5.45.107.88:70-185.22.143.172:49828.service failed. A list of all Gophermoon service names and connection information. In a later blog post I will show how to parse and aggrgate the connection information for some nice statistics (available via Gopher protocol of course). With every blog post, I will post the link to the commit associated with the blog post. Today Gophermoon learned how to serve static text files. The program first looks at the selector send by the client. If the selector is empty, and uses the root directory. Lines that do not contain a tabulator are formatted as "i" (Information) file type. gophermap = filepath .. "/gophermap"
If the selector isn't a directory, the program checks the selector is a readable file, and if it is, it sends the file gopher-style (with CR/LF and terminating the file with "."). I will not change the (minimal) Gopher server (this time), but will prepare the execution environment for Gophermoon: the result will be a container containing, only one executeable and one Lua-Script besides the Gopher content. The container will be isolated from the network and the filesystem and process-space of the host machine. So any coding errors I will create while expanding the Gophermoon-Server will have limited security impact on the host system (unless there is a security issue in the container code of the Linux-Kernel, which there have been in the past. Nothing is fully secure). I'm testing on a RedHat EL 7 machine, but the same result should be possible on other modern Linux systems with a container manager (systemd-nspawn, docker, rkt, LXC …). One feature that makes the Go programming language popular among users of Linux-Containers is the fact that Go produces static binaries. Static binaries have no code runtime dependencies, they are self contained and do not need to be installed, but can just copied around and "just work". Lua is written in C, but we can create static binaries in C too. It is recommended to compile the static Lua binary on an development machine, not on the production Gopher server. Timezone <your-host-timezone> does not exist in container, not updating container timezone. The -x option creates an ephemeral container that is started from an BTRFS snapshot each time a new gopher connection comes in. The snapshot is destroyed as soon as the container terminates. An intruder will not be able to store new files into the container system. Now gophermoon runs in a (more) secure environment. I'm writing a simple Gopher-Server in Lua. I want to play around with the Gopher Protocol, Systemd and Linux-Container and learn some Lua-Programming on the way. Gopher is a document retrieval protocol that had been around the same time the world-wide-web was born, but it is much simpler that HTTP and HTML. It works with plain text and directories, and the protocol on the wire is ultra-simple. The server will be named gophermoon. Gopher (the protocol) is documented in RFC 1436 https://www.ietf.org/rfc/rfc1436.txt with some extension defined as Gopher+ in http://iubio.bio.indiana.edu/soft/util/gopher/Gopher+-spec.text. In the beginning, I will use Systemd to do the network part of the protocol (listening on port 70). The Lua program will just read and write to standard-input and -output. Below is a very simple Lua-Script implementing a Hello-World Gopher-Service. It just emits the lines for a static welcome message. A Gopher-Server waits for a connection and reads the path the client sends (ignored for now). Then it writes the Gopher-Menue out. Each Menu-Line has five fields. The first field is 1 character wide, the other fields are separated by the tabulator character (/t). Each line is terminated by a CRLF sequence. A line with a single dot "." marks the end of the communication, server and client will close the connection. Now we can enable and start the socket (no need to start/enable the service, as it will be started once a connection to Port 70 is made). I just finished to work out a way to clone a MacOS X installation from Linux (for automatic installation of MacOS X with fai – fully automatic installation). All tools discussed in the article are available in Debian 7.x (wheezy). To restore the saved MacOS X installation, boot another Mac using Linux (a Knoppix live Linux DVD will work). parted -s /dev/sda name 1 "'EFI system partition'"
parted -s /dev/sda name 2 "'MacOS X System'"
parted -s /dev/sda name 3 "'Recovery HD'"
If all went well, the new disk is ready to boot MacOS X.